NOTE: Available on Factory Integrated Models only. NOTE: Turbo indicates the maximum potential frequency increment when using Intel® Turbo Boost Technology, with 6,5,4,3,2 and 1(6 cores) or 4,3,2 and 1(4 cores) cores active. NOTE: For the Intel 5600 and 5500 Series, the letter preceding the model number indicated the performance/wattage of the processor. "X" denotes High Performance/Wattage; "E" denotes Enterprise Performance/Wattage (Mainstream); and "L" denotes Lower Wattage. NOTE: All processor models except for those identified below. NOTE: When populating with two processors the 16GB or 32GB Memory Kits (Quad-Rank), only 12 DIMMs can be populated. ** Indicates Option kit designed for PCI-X cards only. NOTE: For external power requirements for PCI options a PCI Thermal-Power Kit is offered optionally for higher power requirements. 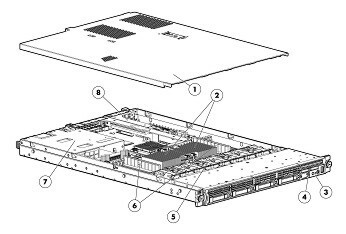 NOTE: Two PCI-Express Gen 2 expansion slots: (1) full-length, full-height slot and (1) low-profile slot. Optional PCI-X Riser expansion slot for PCI-X cards only. NOTE: This option available on 4 drive bay models only. Drive Bays 4 SFF Bays standard with option for up to 8 SFF drive bays total. NOTE: 4 bays standard in Entry, Base and CTO models, with optional upgrade to 8 bays with the SFF HD Backplane Kit (516966-B21). No CD or DVD options available when server is configured with 8 drive bays. NOTE: This option available for 8 drive models. HP External USB CD/DVD R/RW Drive available for 8 drive systems (must be ordered separately). NOTE: PS/2 ports have been removed for NIC expansion. NOTE: ProLiant DL servers do not ship standard with NEMA power cords that allow connection to 110V US wall outlets in a home or office. ProLiant DL servers are primarily connected to PDU's in data center racks so they ship standard with only a PDU power cord (416151-B21). If a user wishes to power a ProLiant DL server using a standard wall receptacle (NEMA-15), the NEMA power cord must be ordered separately and the server will be shipped with both cords. If the order is a Factory-Integration order only the NEMA-15 power will be shipped. See Power Cords in the Additional Options section below. NOTE: All HP Common Slot Power Supplies are not supported by all ProLiant Servers. Please check your server QuickSpecs to confirm support by that server. HP's CS power supplies support multiple energy efficiency initiatives including Climate Savers Computing Initiative (CSCI) and ECOS Consulting/80PLUS ratings for Silver, Gold, and Platinum power efficiency. Additionally, server models that meet efficiency requirements for Energy Star compliance will be published once testing has been completed. HP's -48VDC power supply is designed for those environments that require DC Voltage to operate. This power supply supplies up to 1200Watts of power on 48 Volts DC and comes with a DC power cable. NOTE: The processor option kit contains 1 additional fan module, when upgrading from a 1 processor to two processor models. A Fan Module Option kit can also be purchased separately for use with PCI Graphics card upgrades. See HP PCI Thermal Power Kit (519254-B21) in the Core Options section. NOTE: For more information on HP's Certified and Supported ProLiant Servers for OS and Virtualization Software and latest listing of software drivers available for your server including how to purchase from HP, please visit our OS Support Site at: http://www.hp.com/go/ossupport and our driver download page www.hp.com/support/DL360G7. NOTE: Total of 18 DDR3 DIMM slots. NOTE: For 4 addition HD Bays, slots 5-8. This option will work on both DL360 G6 and G7 servers. NOTE: For Smart Array P410i Controller and Smart Array P212 Controller. Not available for factory integration. HP Power Cords NOTE: The HP ProLiant DL360 G7 ships with an IEC-IEC power cord used for rack mounting with Power Distribution Units (PDUs). For specific power cords purchase from the following.